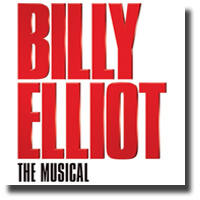 Based on a true story (although the names have changed) Billy Elliot was originally written by Lee Hall and was first produced as a film in 2000. Because of its success as a film, it was made into a musical. Hall also wrote the book and lyrics plus music by Elton John. The musical opened in London in 2005. The Vancouver premiere last April 2nd was an outstanding success. As I left the QET, comments like "Wow, what a great show!" were uttered by members of the opening night audience. No wonder it's still running at the Victoria Palace Theatre in London. I think that the success is due to its uniqueness. It focuses on child actors. The role of Billy is alternatively played by Ben Cook, Drew Minard, Noah Parets, and Mitchell Tobin, all aged 12-13. The actor/dancer who played on opening was Minard, from Iowa, and this talented boy danced, sang and acted to the amazement of the Vancouver audience who gave him accolades and a standing ovation at curtain call. What also makes this show unique is the focus on ballet dancing. Broadway musicals are normally guilded with tap dancing as did this musical. But what talent for a boy of 12 tap dancing and also doing the ballet! I was particularly impressed when he danced Swan Lake and the scene showed him dancing with the older Billy, Maximilien A. Baud, who is a professional ballet dancer. The supporting actors/dancers Janet Dickinson (Mrs. Wilkinson), Richard Hebert (Dad), Patti Perkins (Grandma) and Cullen R. Titmas (Tony) also did outstanding performances together with the other 30 or so members of the troupe. I wasn't particularly impressed with Elton John's music, as some of the tunes reminded me of Les Miserables, but Hall's lyrics were biting, especially the song "Solidarity", which reflected the unsuccessful one-year strike of the National Union of Mineworkers in Durham in 1984. The audience also enjoyed the parody on Margaret Thatcher in the song "Merry Christmas, Maggie Thatcher". I was also impressed by Ian McNeil's set design, and accolades to Peter Darling's choreography which, I thought, if it weren't for this, the musical would not have been as successful as it has been through all these years. Kudos also to Music Director Bill Congdon for the outstanding orchestration. The musical plays for another five days. So get out there and buy your tickets before the show sells out. 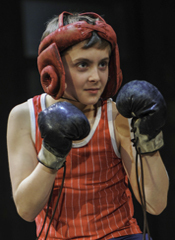 Billy Elliot is about a boy from a blue collar background in North Eastern England who preferred ballet to boxing. Unlike the fictional Billy, 13-year-old Noah Parets is fortunate to have parents who have encouraged his dancing. He is currently sharing the title role in the Broadway Across CanadaTM touring production with Ben Cook, Drew Minard and Mitchell Tobin. When Noah isn’t touring on the road he lives in Sharon, Massachusetts with his Mom, Dad and 16-year-old brother Ethan who also sings and performs in his High School productions. His mother Robyn, who travels with him on the tour, runs a Yoga Studio in Sharon. When I asked him about achievements thus far in his short career, he was both proud and modest in discussing his success at the 2011 American Dance Awards where he won the award for Best Junior Male Dancer. He didn’t talk about it, but he was invited to sing the National Anthem before the game at Fenway Park last August. Noah is excited about visiting Vancouver for the first time. When not studying or working he probably be sighting-seeing with some of the many younger cast members. He plans to visit Stanley Park while in town. Noah is under contract at least through December and isn’t looking beyond then. While in New York City he attended Newsies The Musical, a stage musical inspired by the real-life newsboys strike. He had such a good time seeing the show that he would relish the opportunity to audition for a future production. Because performance schedules are made up just a few days ahead of venue opening, Noah was unsure in which of the eight Vancouver shows he will appear.